The S.D. 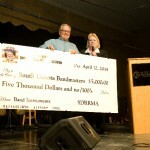 Rock and Roll Music Association presented SDBA a check for $5000 at their recent induction concert in Sioux Falls. Board member John Mogen presented a check to SDBA President Helen Mogen. In an effort to give back to music education, five $1000 grants will be made available for South Dakota school band programs. These grants can be used for purchasing instruments, band uniforms, or other items directly related to your music department. They cannot be used to pay salaries or for other non music items. Band programs who wish to apply are should write a one-page essay stating their plan for using the $1000 grant. Applications should be sent to Helen.Mogen@k12.sd.us by May 7, 2014. The winning programs will be announced the following week.